We pride ourselves on our rigorous, data-driven, transparent divorce mediation process. Years of experience have proven that our process, when led by an experienced attorney-mediator, provides fair and reasonable results for our clients. As with most things in life, preparation is the key to success in divorce mediation. Our attorney-mediators will, of course, extensively prepare for your case and come to your session with a clear plan of action. But there are some things you can do before your session to ensure it will be as productive as possible. If you have questions for our divorce attorney-mediators located in Denver, or for questions about our Chicago divorce mediation process, please call Split Simple today at (855) 665-9920 for a free consultation. 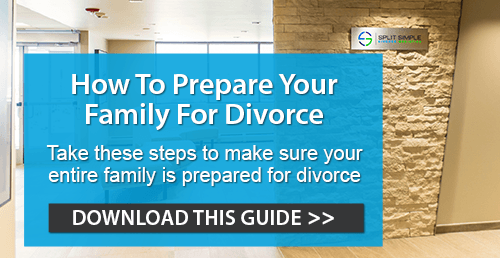 We know that preparing for a mediated divorce session can bring up some unpleasant emotions. After all, this isn’t some conference workshop you’re prepping for – it’s the beginning of a process that will end with an uncontested divorce. Perhaps the most important thing you can do is to get yourself in a mental state where you can keep calm during your divorce mediation session. Divorces drag out because the simple arithmetic of a separation gets tangled up with the emotions of dissolving a long-term relationship. Take time to prepare yourself mentally- it’s important you stay calm and focused during your session. Look over your finances and figure out what your financial priorities will be. Our experienced divorce attorney-mediators help with financial matters, but knowing what you expect to need will make things easier. It’s a good idea to have some preliminary discussions about child care issues with your spouse before the session. Our attorney-mediators located in Denver and Chicago understand how important these issues are and work to find a solution that’s best for your child. Still, these issues are so vital that it’s a good idea for you to have at least a general sense of what you both are thinking before the divorce mediation session. Go through a similar process with other pieces of personal property held within the marriage. Make an honest accounting of what matters to you – putting up a fight over a given item just to put a fight is counter-productive. With the right preparation and attitude, you can expect a calm, productive divorce mediation session and a process that reflects those conditions. If you want to speak to our attorney-mediators about pursuing a mediated divorce settlement, please call our divorce attorney-mediators located in Denver and Chicago today at (855) 665-9920 or contact us online.